[This text opens a series of stories under a general title “War Trajectory”. A trajectory is a trace, most often invisible, made by a moving body. The war which goes on in the east of Ukraine also leaves its trace in our lives, changing destinies or driving out of homes. War trajectory is destructive. 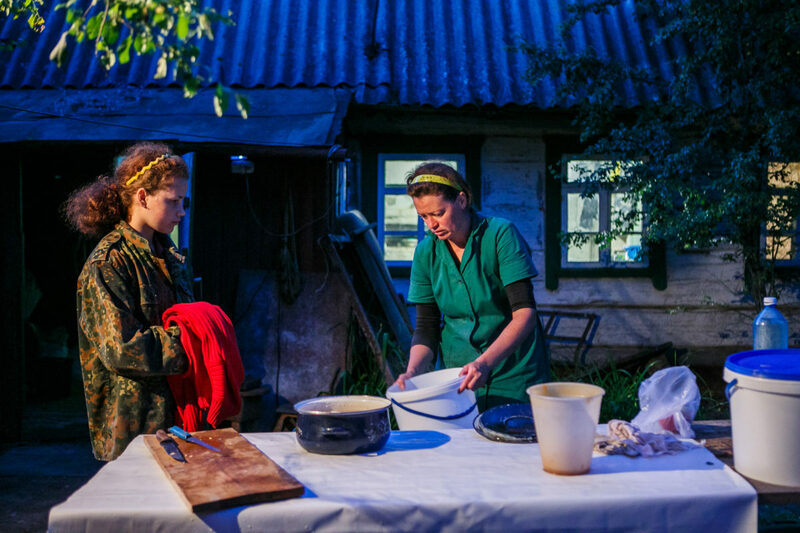 To survive, Ukrainians must be strong and ready to give a helping hand to those in need, remembering that we might have different personal problems, but one shared grief. 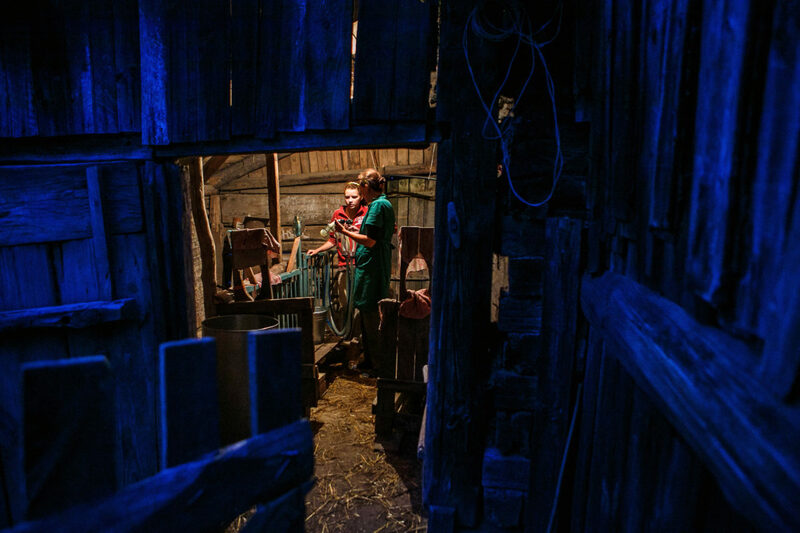 15 years ago the population of Desiatyny village in Zhytomyr region was slightly above a hundred. Today the village community hardly has 30 residents. It could have disappeared from the map of Ukraine at all, if it wasn’t for Olexandr Kononov. 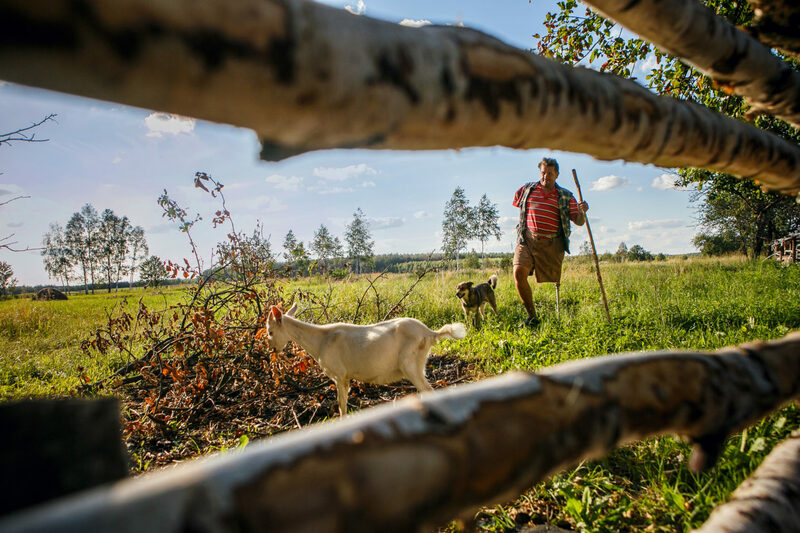 For more than three months he has been tortured in the “LPR” cellar prisons, but his spirit didn’t break — he’s bought one of long abandoned huts in Desiatyny, brought the goats and sheep he always liked — and now is rebuilding not only his life but the life of the local community. 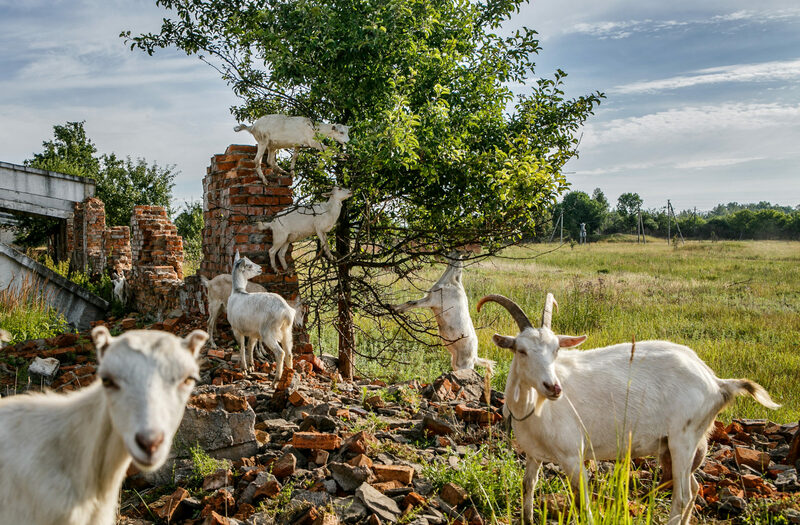 A herd of goats is wandering among ruined brick walls. The skeleton of a former farm, lost in deep forests of Zhytomyr region reminds that life had once been blooming in these thick forests. It’s difficult to find a road to Deasiatyny even with a GPS SatNav. Cars are really rare here, and these roads are owned by storks and beavers. — “Bela-bela, bala-bala!” — the shepherd is calling his herd out from the ruins of the cowshed. His strange call is echoing in the tombstones of a local cemetery and disappears in surrounding dense greenery. — “Baaah, maaaaah” — the cattle replies reluctantly, but follows obediently. 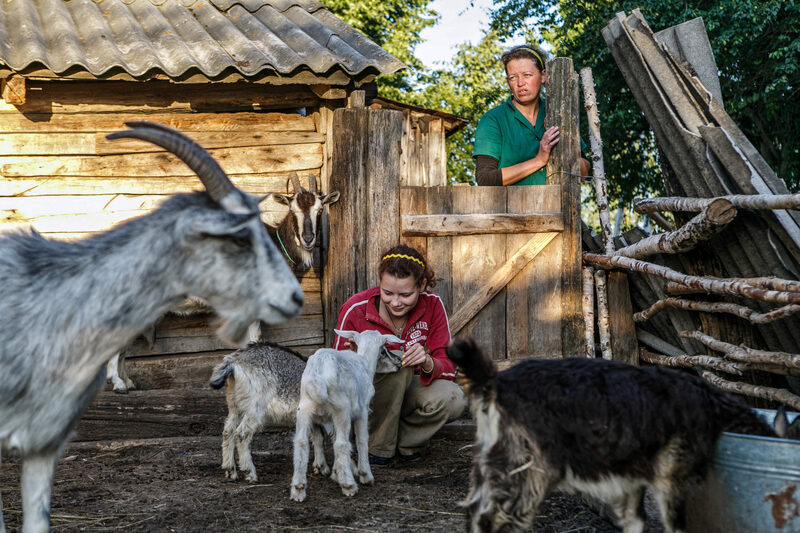 The local goatsman’s name is Oleksandr Kononov. He was an alien in Desiatyny, moved in last December from Sieverodonetsk in Luhansk region, by invitation of a friend, volunteer activist. 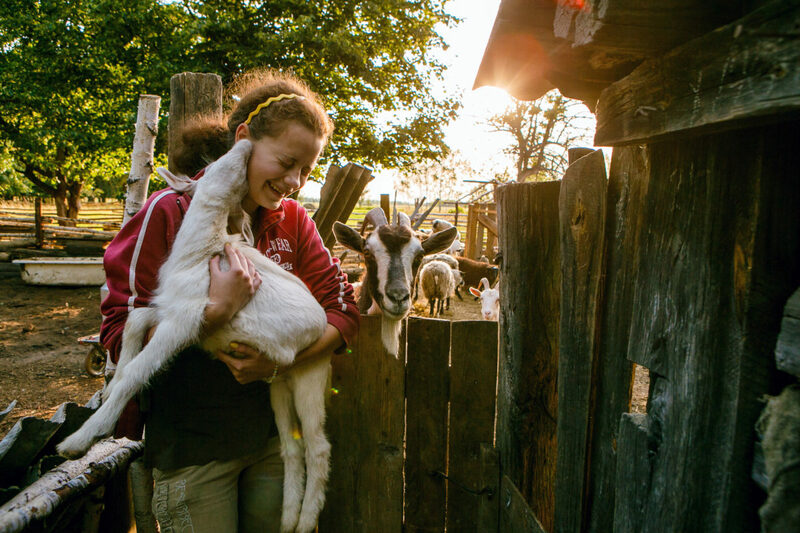 They have decided to start a goat farm and cheese production. 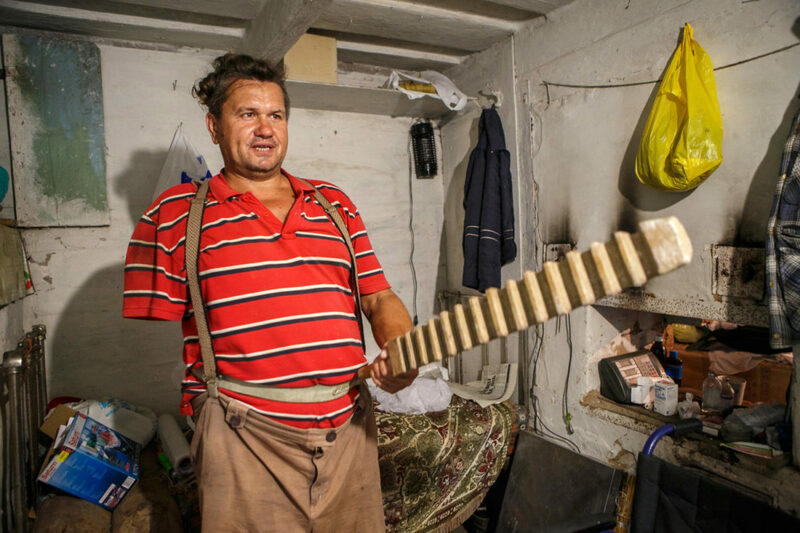 Oleksandr leans on a long staff — not for a fancy look, but he’s just disabled and has no right arm and left leg. 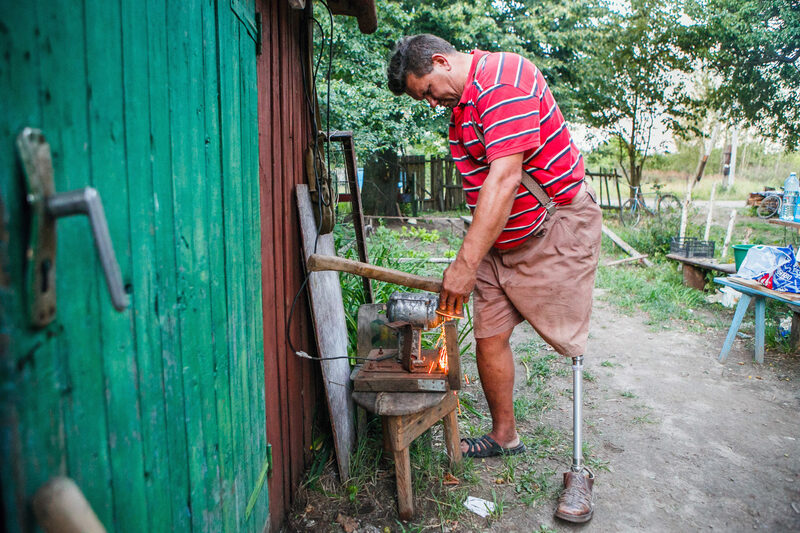 The man had lost his limbs 11 years ago at a metal factory. But he didn’t despair and didn’t lose the will to live. 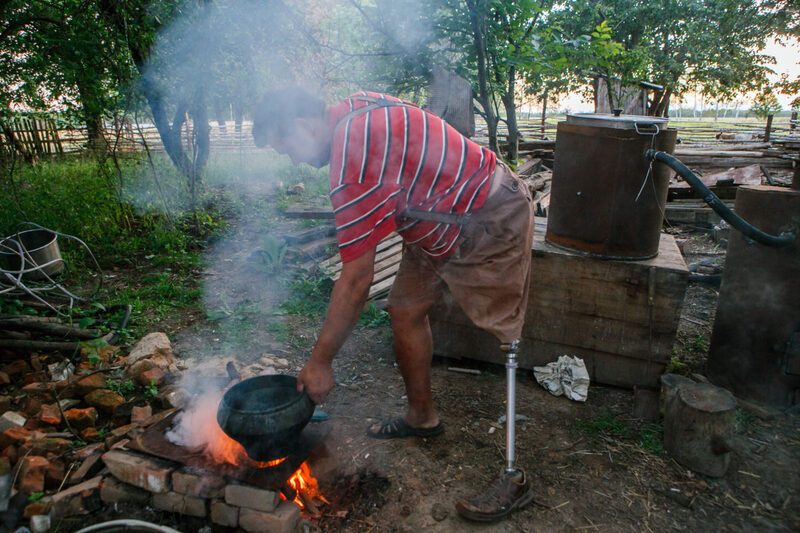 “Being stuck in a “Bermuda triangle” of kitchen, toilet and bed is not for me,” tells he about his creed, crossing a dewy meadow on a prosthetic leg. 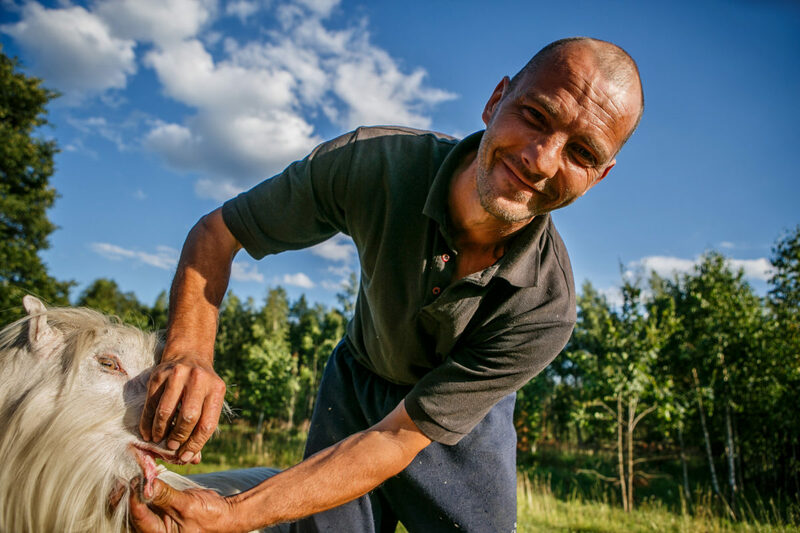 A few years ago Oleksandr could not even have imagined that he’ll become a farmer. 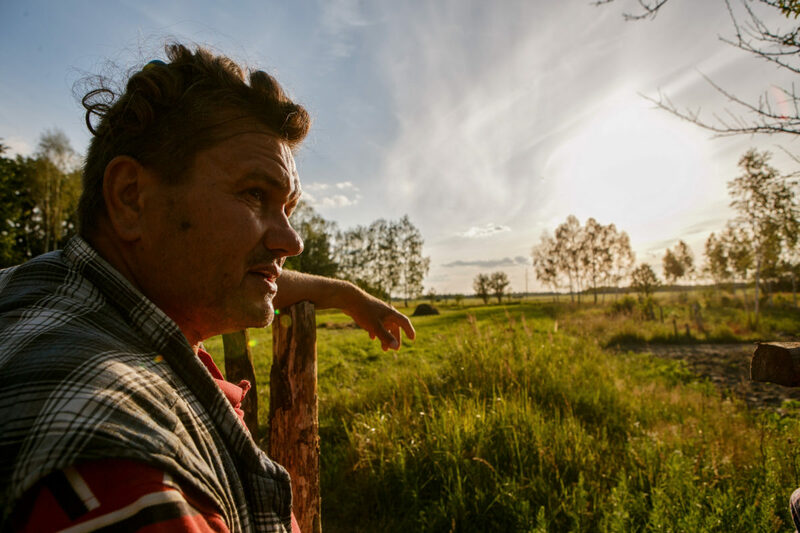 But the war that came to Luhansk has driven him out of home and made him find a new destiny 900 kilometers from his native places. — “War has made me even stronger”, reassures us the herdsman from the East. Another family from Luhansk oblast has followed Kononov to Zhytomyr region. The Donbas diaspora in Desiatyny has grown to five persons. First the locals were treating the outsiders with distrust, as this forest folk is extremely conservative. But Kononov has slowly been teaching them political information. He is well able to teach them to love the Motherland. 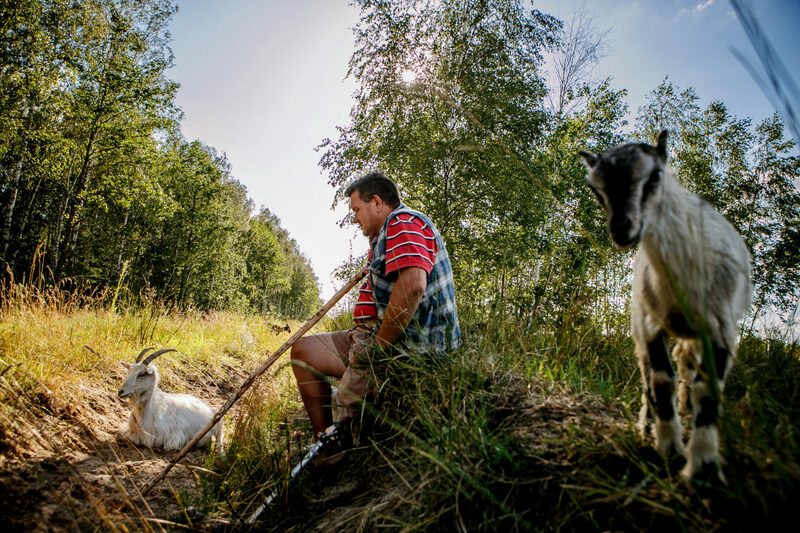 A one-legged goatsman is sitting on a hillside. Sun glitters on his metal prosthetics. It seems like Oleksandr is just taking some tan. Smiling, he doesn’t look helpless at all. Ans his cheerfulness is cast even onto dogs — they keep waving their tails, running around the master. Before the war Oleksandr Kononov was a civil activist in the “Legal awareness for drivers” campaign. 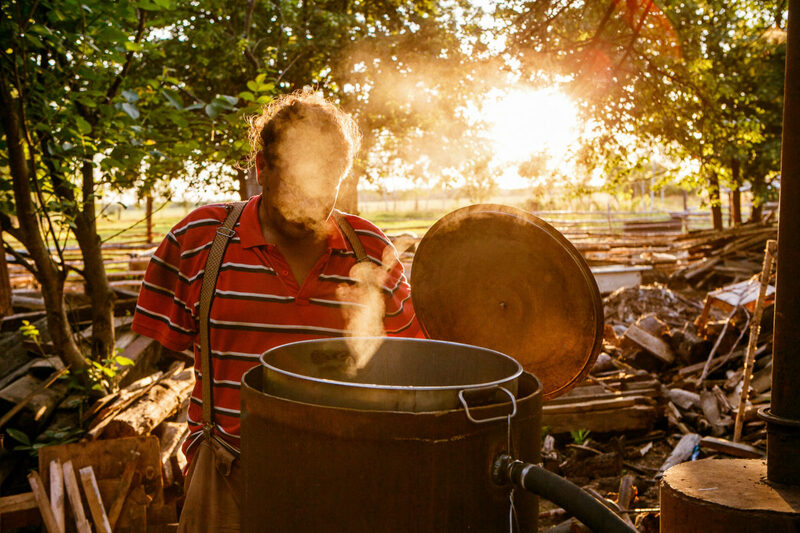 When fighting started around Sieverodonetsk, he began to help the Aidar fighters: brought water, food, medicines and household chemicals to Polovynkyno, Shchastia and Starobielsk. One of the trips however was unfortunate — the volunteers’ bus has mistakenly entered the separatists’ roadblock in Yuvileyne. 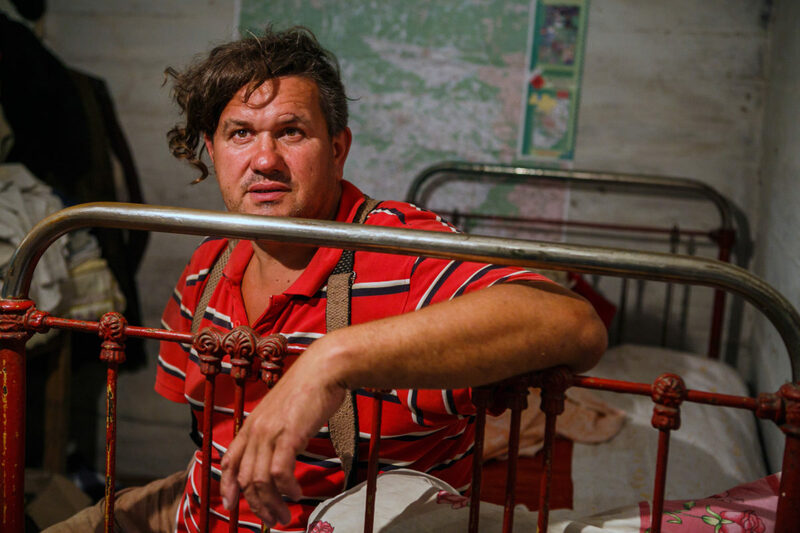 Oleksandr has spent 98 days in captivity. The man is raising his shirt, showing a scar on the shoulder. He’s surprisingly calm when talking about imprisonment and tortures. For the first month he was kept as “extremely dangerous” in Luhansk jail. 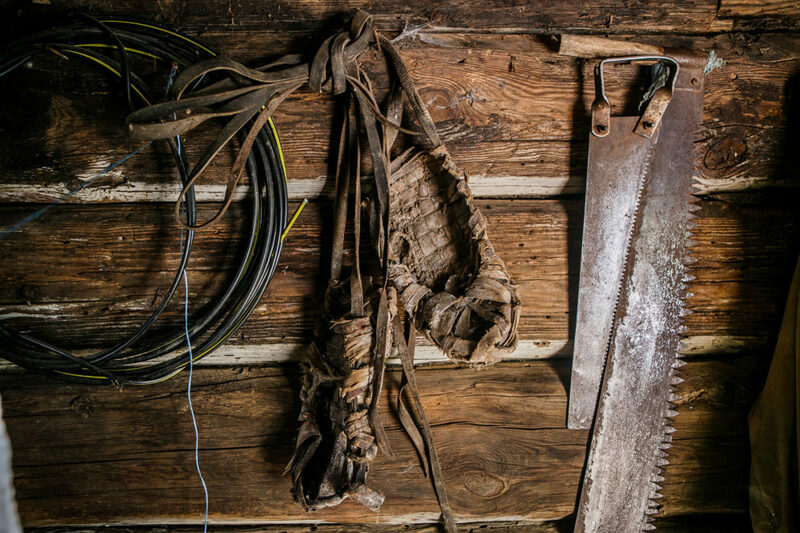 Next he was kept in the prison cellar of the regional administration and later — in the new “Commandant’s office”. 40 persons — men and women together — stayed in a small unventilated cell. 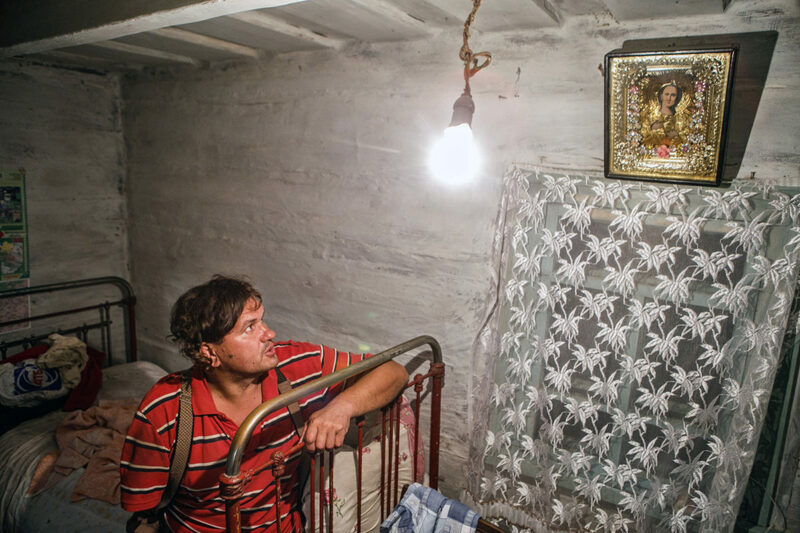 Oleksandr has met really different people there: coalmine managers, art gallery curator, convicts and brokers… Many people were imprisoned on their neighbours squeals. So it happened. After almost a hundred days in captivity he, seven soldiers and three civil prisoners of war were released as part of the exchange. By that time Ukrainian flags have already been flying over Sieverodonetsk for three months. But still, Kononov didn’t want to stay there. 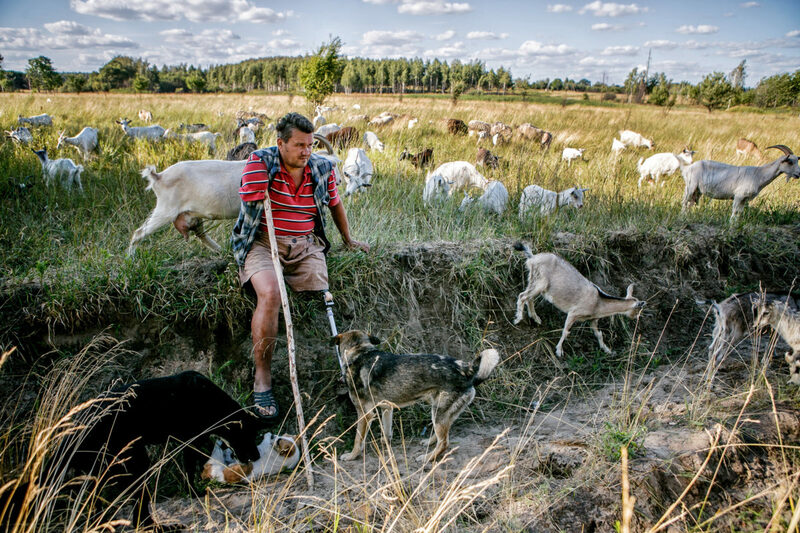 He took nine goats, five sheep and two lambs — and moved to the forests of Zhytomyr region. — “How come?” I ask. The most expensive house in Desiatyny costs under a thousand dollars. 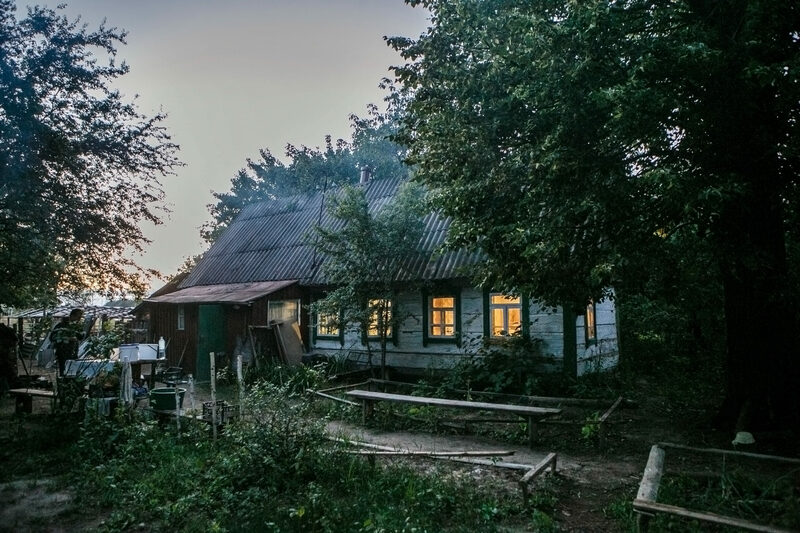 Oleksandr Kononov has bought his even cheaper — for 13 thousand hryvnias: a wooden hut with dirt floor, an oven, the smell of mold and something ancient. From all the benefits of civilization there’s only electricity. No running water – they have to use a neighbour’s well. The house has been empty for seven years, so it keeps the new owner busy. But on the positive side — there are many antique things left from previous owners. — “Do you know why Ukrainian women are so independent? I’ll show you a really cool thing”, intrigues Oleksandr. From a pile of stuff he pulls out a real smoother. — “The man comes home drunk and she would smooth him with this thing”, he laughs. 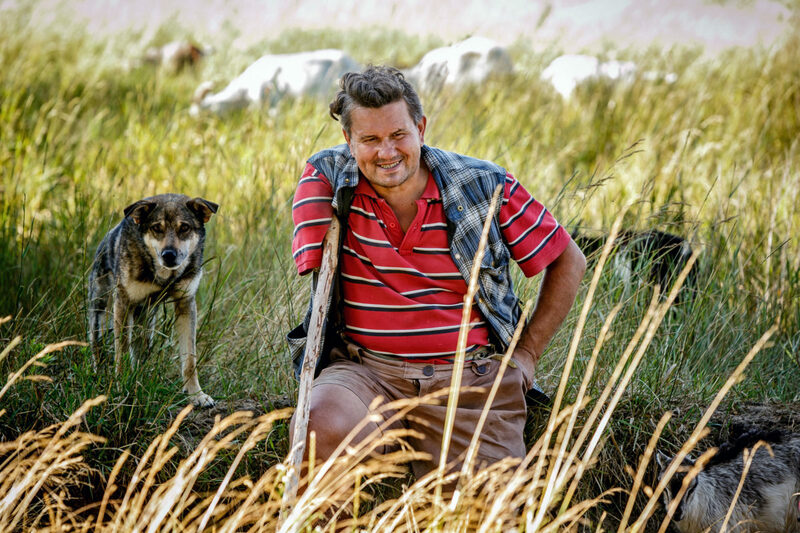 Oleksander is a self-taught cheesemaker. Every day he is perfecting the technology. As the saying goes, he does it with his left hand only — but literally. 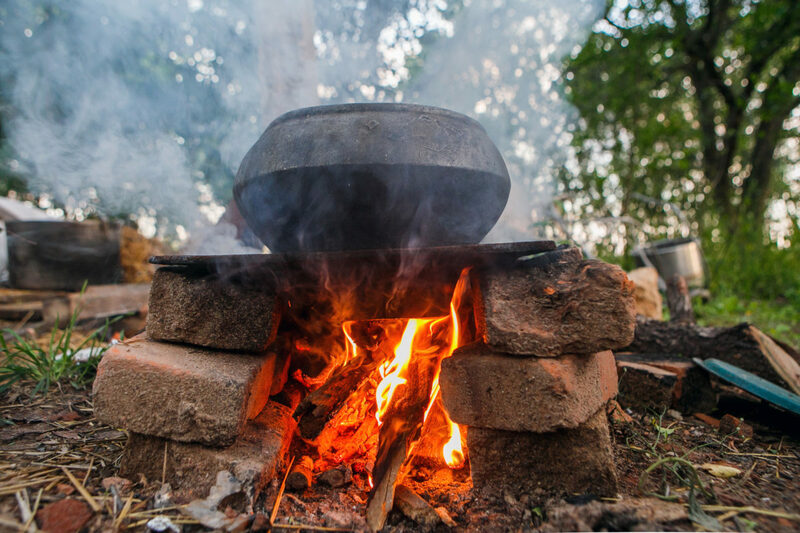 For now he manages with a small electric stove, but soon the production will be moved outside: there they have already set a potbelly stove with a bain-marie. It takes 30-40 litres of milk to make a five kilo block of cheese. For now all his farm’s daily production of milk is enough for two blocks. 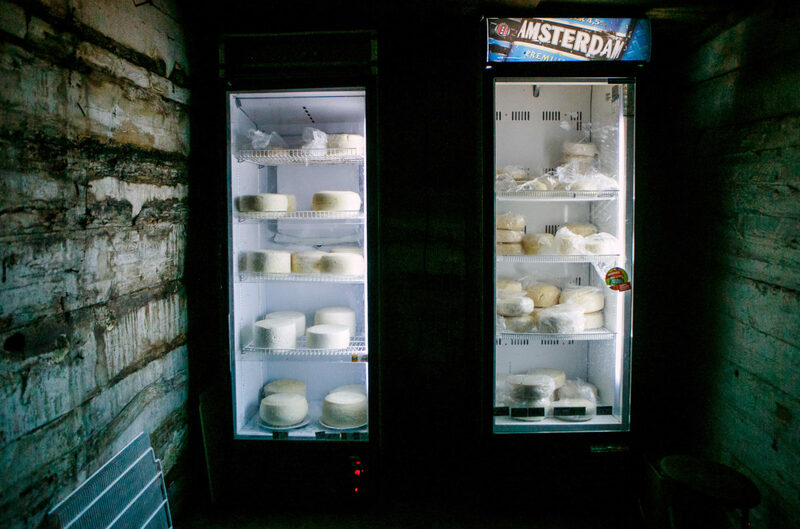 The Desiatyny cheese can already be bought in several shops in Kyiv (retailers get it at 230 UAH a kilo). For now Oleksandr can only dream of scaling up. 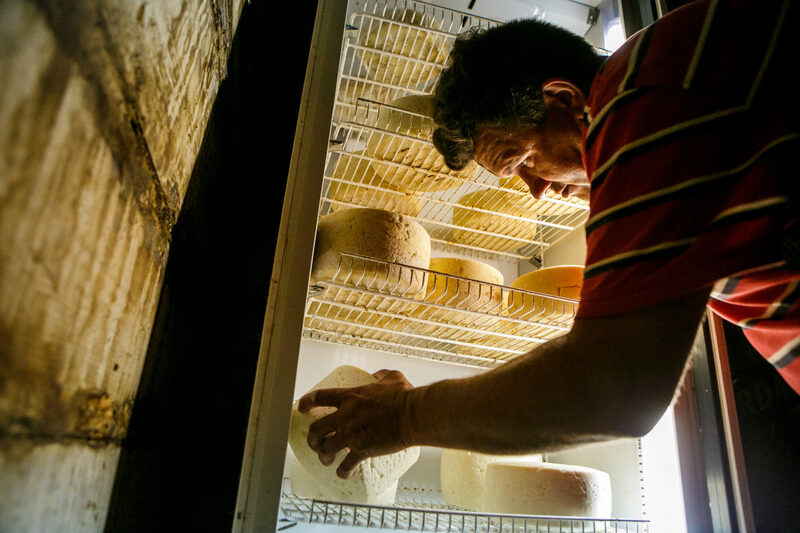 Every block of cheese, says Oleksandr, is a real treasure, an exclusive product, with different shades of taste, smell and texture. — “Sure thing! Toadstool cheese «Fantastic», The «Dear mother-in-law» with a deadly amanita, the «High in the sky» with hemp,” Oleksandr adds jokingly. Sunset rays are shining through thick forest branches, filling in the yard with what looks like pink syrup. A pot is boiling on the fire. 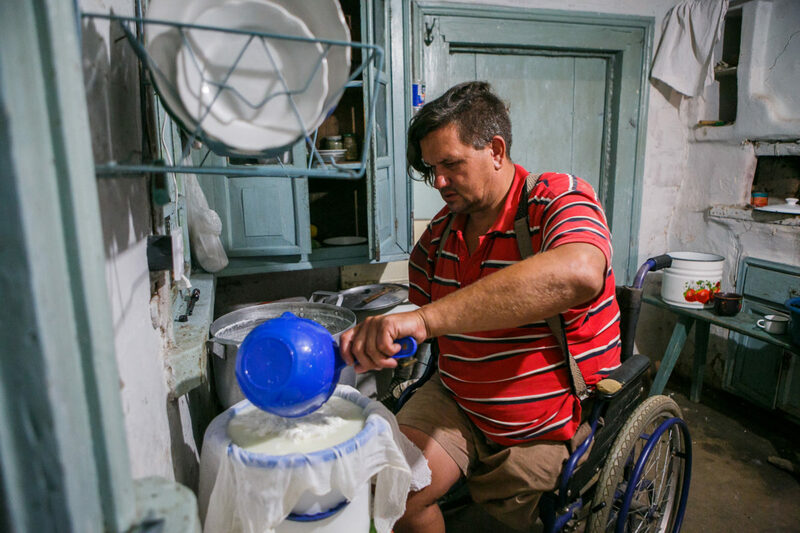 Oleksandr Kononov is stirring shurpa soup with the spoon and thinking about the future. His plans are far-reaching. 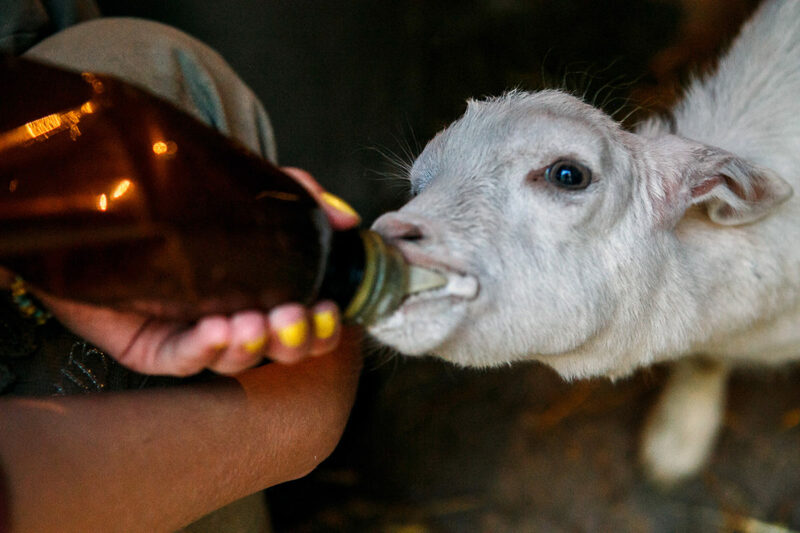 At the moment the man has 45 milk goats, 70 goatlets and 15 sheep. He needs at least three hundred beasts to make it sustainable. Oleksandr with friends are planning to make this herd throughout the next two or three years. His main goal is selling organic produce. If Oleksandr’s plans will come true, true Renaissance will come to Desiatyny. Seems like Oleksandr has answers to every question. Doubts and fears are not for him. Night comes to Desiatyny. Cattle goes to sleep in their barn. Stars, brighter than the city lights, shine through the branches. 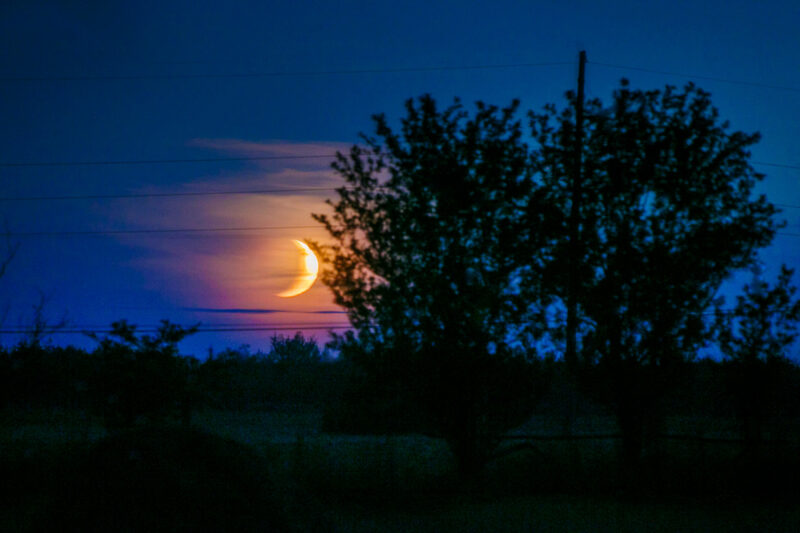 The moon is there like a block of cheese. It’s way past midnight, time to sleep. In four hours Oleksandr will be up again, will take a cup of strong tea and lead the herd again. 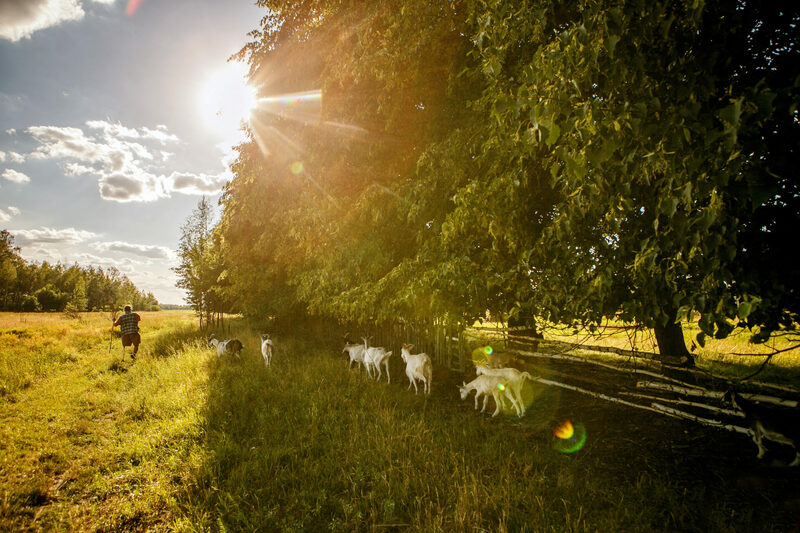 Will he find happiness in the forests of Zhytomyr region? His careless smile and glint in his eyes tell me that he has already found it. PS. 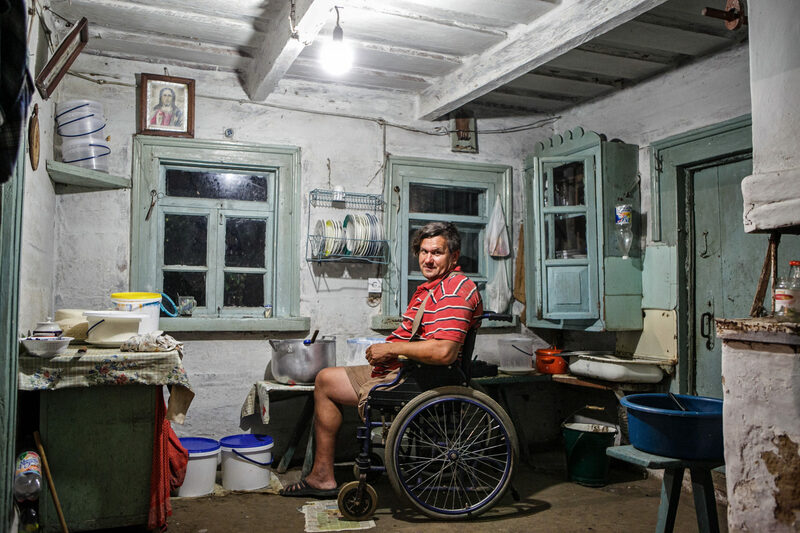 Official statistics of the Ministry of Social Policies say that there are over 72000 disabled persons among Ukrainian IDPs. Text — Yevhen Rudenko. Photo — Danylo Pavlov.